Was Lance Armstrong’s comeback to professional racing a hit or a miss? 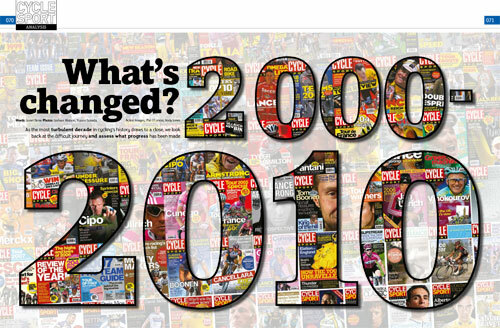 That’s the question asked by Cycle Sport magazine in the new January 2010 issue, out now. 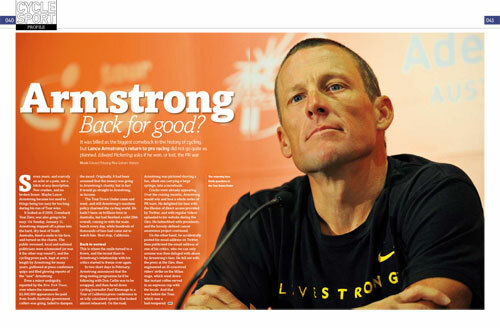 Cycle Sport assesses Armstrong’s much trumpeted return to the sport in 2009 after a three year hiatus, and asks if everything went to plan and whether the Texan won or lost the PR war. There were many great rides in the 2009 racing season, and CS attempts to pick out the top 50 of the year, starting with David Zabriskie’s defence of the Tour of Missouri race lead at number 50. CS’s experts make their pick and talk to some of the riders who were part of the stand-out racing feats of the past 12 months. 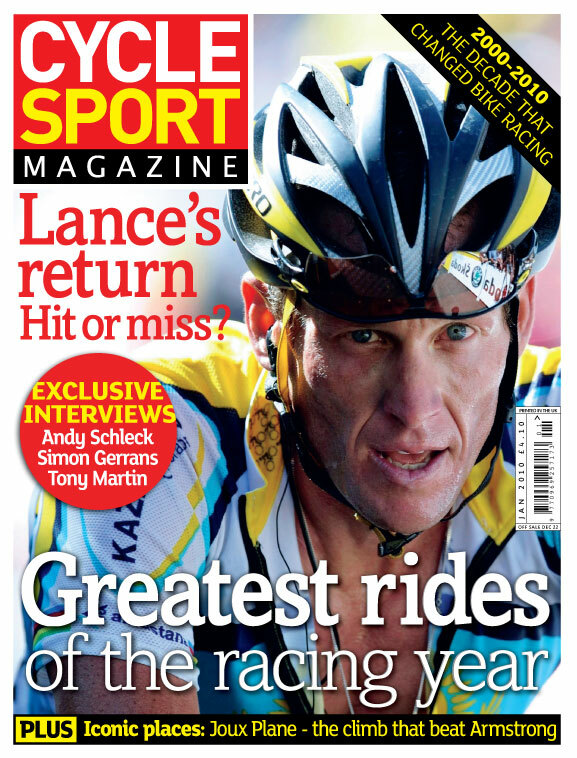 Plus in the packed issue there’s an exclusive interview with Tour de France hopeful Andy Schleck; Tony Martin sets out his aims for 2010; a look back at the 2000 season to see how cycling has changed in the past decade; multiple Grand Tour stage winner Simon Gerrans talks about signing to Sky; and much, much more. 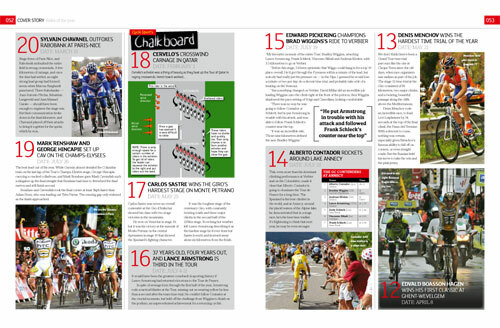 Cycle Sport January 2010 issue is on sale now at WHSmith, major supermarkets and all good newsagents priced £4.10. Lance Armstrong’s comeback – how satisfied can he be? 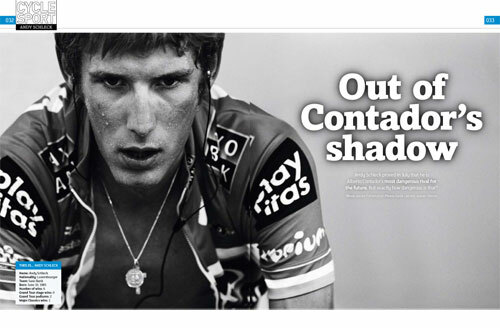 CS sits down with Contador’s greatest rival for an exclusive interview. All the stats and rankings of 2009: who were the best riders and teams. Comparing the cycling scene in 2000 and 2010. How has the sport changed? Can Tony Martin swap a Tour de France white jersey for a yellow one in 2010? CS talks to the only Brazillian rider in the ProTour, Murilo Fischer, about the 2016 Olympic road race. Exclusive interview with one of Sky’s major signings for 2010, multiple Grand Tour stage winner Simon Gerrans. CS visits the the beautiful and deadly Col de Joux-Plane, where Lance Armstrong never came closer to losing a Tour de France. Bradley Wiggins to appear in The Simpsons. Review, Focus, Toto, your letters, and more.